A Tasmanian cheese making business has won the prestigious Telstra Australian Business of the Year Award. The Bruny Island Cheese Co, an agritourism and artisan cheese producer who makes Australia’s only unpasteurized cheese, made history on Thursday night for being the first Tasmanian company to ever win the top honors at the awards. Bruny Island Cheese also took home the Telstra Small Business Award. In a report on The Mercury, the company’s Chief Financial Officer Tom Mollison said the award is a boost for artisan producers who put a premium on quality and applying new technologies. Bruny Island Cheese’s founder and Managing Director Nick Haddow is in Iceland, but took to Twitter to express his delight for winning the award, calling it a “very humbling” experience. “We did it! Bloody incredible! Thank you to all my team and all our customers,” he tweeted. Back in July when they won the Tasmanian Business of the Year, Mr. Haddow says he is very passionate about cheese making. “Cheese making is a pursuit of integrity and flavour and Tasmania is an ideal location for these pursuits,” he said. Telstra Business group managing director Will Irving said the panel was impressed by Bruny’s artisan production techniques combined with their state-of-the-art marketing and packaging practices. 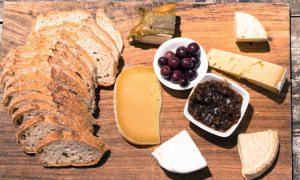 “Bruny Island Cheese Co is a role model for artisan food businesses in the 21st century. It has a total focus on quality, customer experience and engagement, innovation from paddock to plate and care for suppliers, staff, the local community and the environment,” Mr. Irving said. Bruny Island Cheese Co was established by Mr. Haddow in 2003 with partner Leonie Struthers, using traditional cheese making techniques. The company sells onsite, online and via email marketing to a 8300-strong member cheese club.